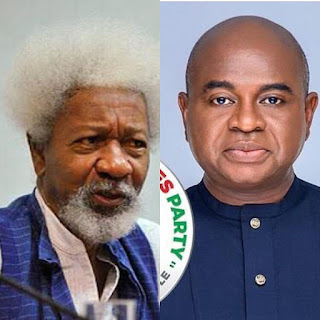 Home Politics WOLE SOYINKA ENDORSES KINGSLEY MOGHALU FOR PRESIDENT, SAYS HE WOULD USE HIS PUBLIC PROFILE TO WOO VOTERS FOR MOGHALU. WOLE SOYINKA ENDORSES KINGSLEY MOGHALU FOR PRESIDENT, SAYS HE WOULD USE HIS PUBLIC PROFILE TO WOO VOTERS FOR MOGHALU. Nobel Laureate, Wole Soyinka, has endorsed former Deputy Governor of the Central Bank of Nigeria and candidate of the Young Progressives Party, Kingsley Moghalu, for the February 16 presidential election. Soyinka made this known through a statement he released to the Media yesterday, which reads: I shall conclude with a somewhat interesting aside. I met Moghalu again on Monday morning, February 4th, and informed him of the Forum’s decision. During our discussion, I happened to ask him – what is the meaning of Moghalu. I was curious, because it had taken quite some time along the way for me to know to which ethnic group the name belonged. He replied, it means – “Evil Spirit, Leave me Be!” Then I asked him for his other names and he spelt them out: “Actually my full names are Kingsley Chiedu Ayodele Moghalu”. Eyebrows raised, I asked, How come, Ayodele? A piquant revelation resulted: “Oh, that came from Mrs. Funmilayo Ransome-Kuti. She was friends with my father. Mrs. Kuti was my godmother, and she gave me the name Ayodele”. Professor Soyinka, had a few days ago called on Nigerians not to vote for President Muhammadu Buhari of the All Progressives Congress (APC), as well as his main challenger, Atiku Abubakar of the Peoples Democratic Party, saying that both parties and their candidates have failed Nigeria and have nothing new to offer the country. According to him, he would use his public profile to woo votes for Mr Moghalu in next week’s election, but what remains to be seen is how intends to do that successfully when the election is around the corner, just one week away and being that he is neither a politician, nor one with his political structure, being effective and resourcesful to Moghalu is another entirely. Can Professor Wole Soyinka successfully convince anybody in Nigeria to vote for any candidate of his choosing and the person will agree? Does he really vote and can he verifiably win his own polling centre for anyone? As we wish Professor Kingsley Moghalu a very fruitful outing on the 16th of February 2019, it would be worthy to note that Wole Soyinka is not one with electoral values that will culminate into votes at polling units and centres across Nigeria, such that will make one win an election. But……his endorsement is very fantastic for image boosting and laundering.